The Swan MF20000WM.001 double basin wall mount utility sink is an out-of-the-way dual laundry tub that lets you pre-ready two loads at Once. 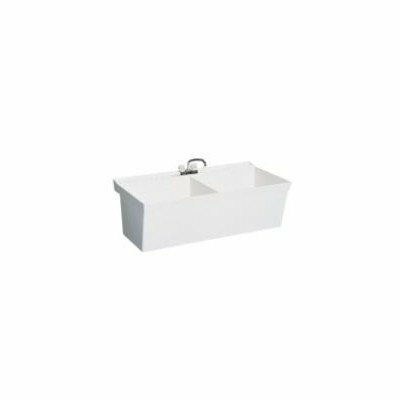 The whole unit is made from solid white veritek and comes with a molded-in back board that's pre-drilled for a 4-Inch center faucet (not included). the tubs offer a TOTAL capacity of gallons between them. The piece is wall-mounted and comes with all the necessary mounting hardware. Made of sturdy veritek material with molded-in washboard comes with pre-dilled 4-in. Centers (faucet not included) easily wall mountable using included wall bracket assembly 44-gal. Capacity and comes with installed drain overall dimensions: 45.3W x 23.3D x 33.5H in. If you have any questions about this product by Swan, contact us by completing and submitting the form below. If you are looking for a specif part number, please include it with your message.